ANA Round the World Award flight from LA: 8 stopovers for 115,000 miles. The ANA Round the World award flight above would cover 8 stopovers: Tokyo, Seoul, Peking, Istanbul, Vienna, Paris, New York, and Las Vegas. It would cost 75,000 in Economy, 115,000 in Business Class, and 180,000 in First. What Is the ANA Round the World award? The ANA Round the World award chart is an obscure gem that doesn’t get much attention (which is a good thing). In most instances the ANA Round the World award chart is better than the long-dead AA oneworld Explorer Award chart. Hard to believe, but true. ANA Round the World Award Chart — Great Value! This chart is just the old distance-based ANA Mileage Club chart (or something very close) that ANA had retired before revamping their program. It’s nice to know that this chart is still around. Why? Because it’s incredible. But let’s list the restrictions first. 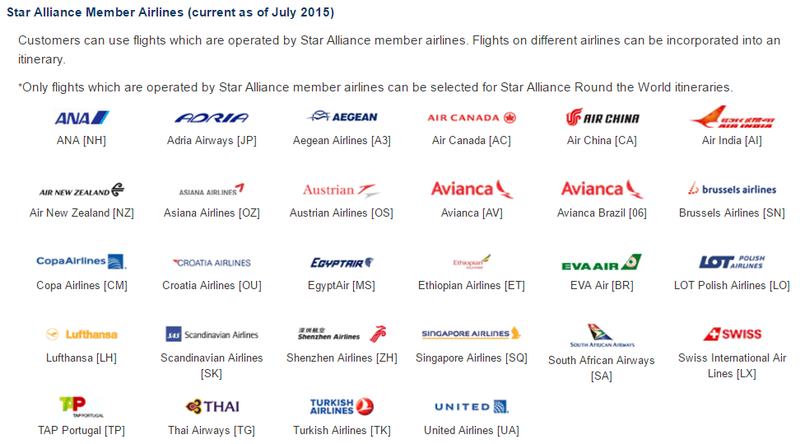 You can only use ANA and Star Alliance airlines for the ANA Round the World ticket. You must fly East-to-West or West-to-East. The trip length should be at least 10 days from your first international departure. Must book on the phone. When you see how few miles you need to travel around the world vs. a round-trip ticket, you will immediately recognize the value. You can use the ANA Round the World Award chart the same way you did or would’ve done the oneworld Explorer chart if it hadn’t been killed so suddenly. If you’re a world traveler who spends most of her time on the road, this is not really a question. All you need to think about is avoiding or reducing those pesky fuel scamcharges. You can fly any Star Alliance airline in the Americas, and you can fly United or Air Canada between the U.S. and Europe. 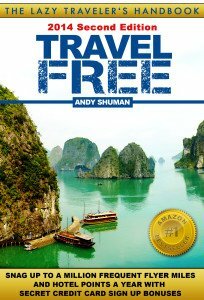 You can fly United or Air New Zealand to the South Pacific, or Air China to China and ANA to Japan and some cities in Asia. Some airlines add smaller fuel surcharges that are tolerable. 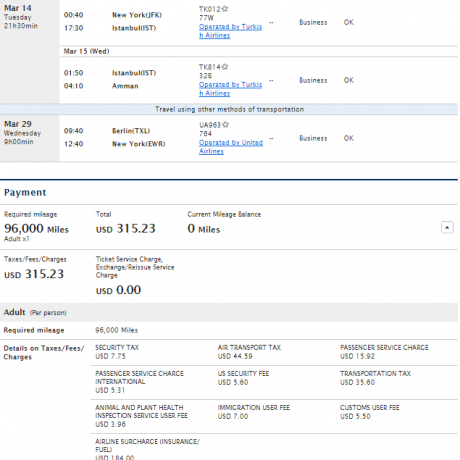 LOT adds $60 per one way to Warsaw from the U.S. while Turkish adds $180 to Istanbul. 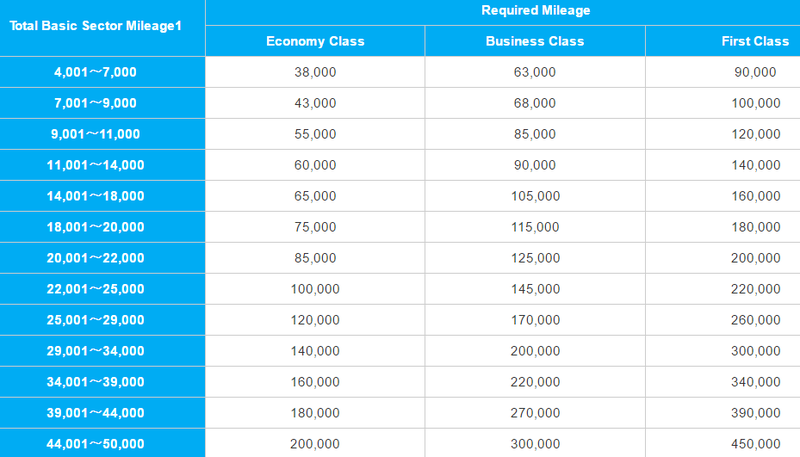 That’s on a higher side of reasonable, but Turkish availability in Business Class is phenomenal. 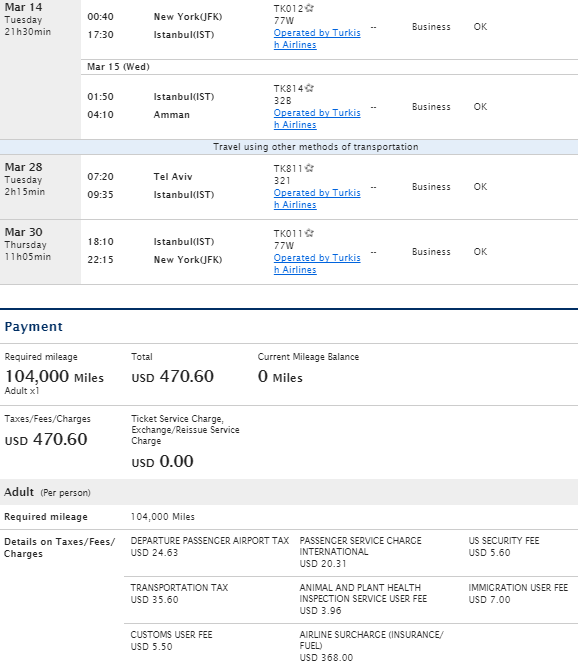 Asiana adds $80 for a one way trip to Seoul. Just remember that the RTW ticket doesn’t allow backtracking, so, if I understand it correctly, you can’t fly to Hong Kong via Japan, if your general direction is to the East. But you can fly via Japan from Hong Kong on your way back home. But what if you’re just an occasional traveler? What if you don’t have all the time in the world to use up to 8 stopovers? Let’s not make it a practical discussion with a trip I’m trying to build for myself. Will I be better off with a regular ticket or the ANA Round the World award? I’m going to Israel in Spring 2017. Israel is one of the most fascinating places on Earth I’ve never been to, and now I’m out of excuses. Or rather I have a perfect excuse — there is a TBEX conference in Jerusalem in March. I’m going! And I also want to see Petra in Jordan. I’ve heard about it so much that I just can’t miss it now that I’ll be so close. And it’s a long flight. 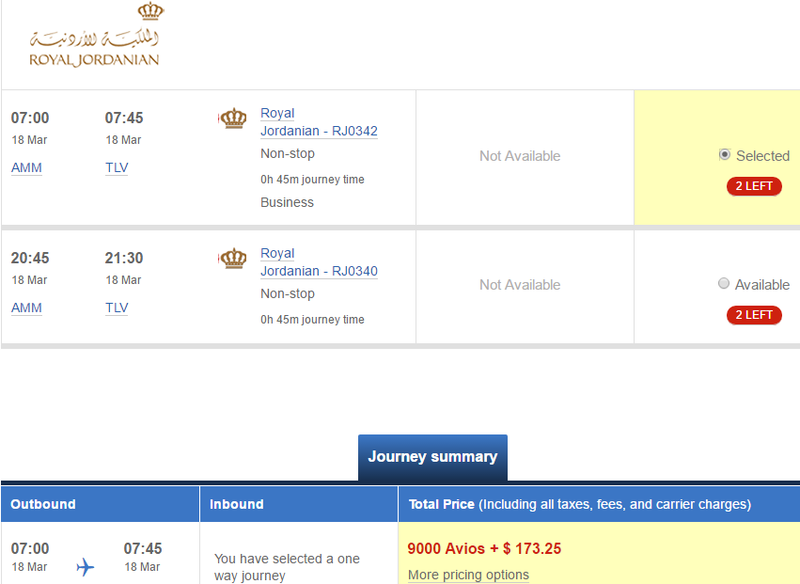 Or rather a combination of flights, because it’s tough to find a non-stop flight to Israel even in coach. So here are my options. Note that in every scenario, I’ll end up spending 9,000 Avios and a whopping $180 for a 45-minute flight in Business Class between Amman and Tel Aviv. Yes, I could tough it up in economy, but they seem to never open economy class. Ever! I’ll have to fly in Business Class for 45 minutes, and it’s not my choice. So, I can go this way — the easy way. 104,000 miles and about $471 cash in Business — the easy way. Or I can go this way and pay less in miles and cash, by flying my inbound flight from Europe, but I’ll have to find my own way from Tel Aviv to Warsaw. While ANA doesn’t let you fly one way, it will divide your miles according to the regions you fly in and out of. 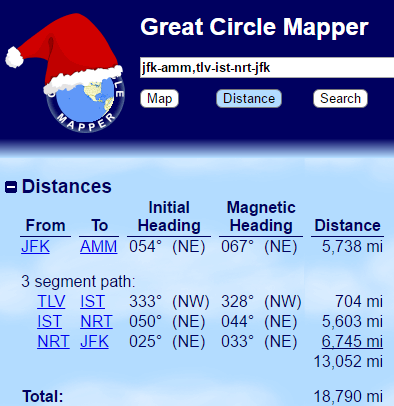 A flight to the Middle East in Business Class costs 104,000 miles, so my JFK-AMM leg would be 52,000. 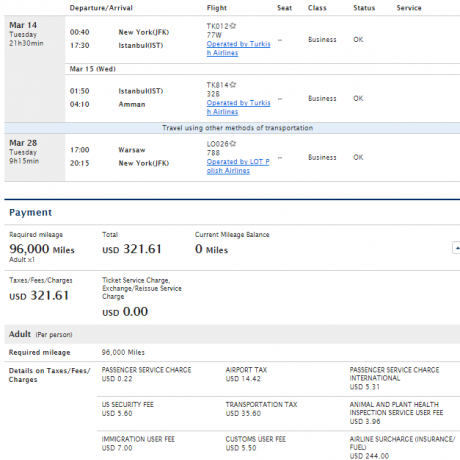 A flight to Europe is 88,000 miles, so my inbound leg from Europe to JFK would cost 44,000. Hence the (small) savings. 96,000 miles and $322 in Business, but I must get from TLV to WAW on my own. Or I can try the third way and pay even a little bit less, but then I’ll have to book a separate Avios flight between Tel Aviv and Berlin. 96,000 miles and $315 for the flight with United on the back end. OK, timeout. How is it possible that the flights on Turkish and LOT cost only slightly more than the flight on Turkish and United? We know that LOT adds fuel surcharge. It’s not too much, but United adds none. So what gives? 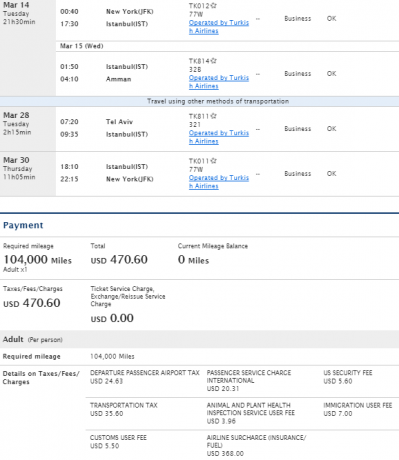 Why is the United flight just $7 cheaper than LOT’s? This god-awful, run-down Berlin airport charges $97 for the departure tax. More than Paris CDG. Look, Germany is crazy about airport taxes. Not as crazy as the UK, but plenty mad, too. They have ridiculous airport taxes everywhere. Munich and Frankfurt are even worse. But have you been to that abomination, that disgrace, that 1970s catastrophe with stinky restrooms called Tegel? My goodness, they’re charging me $100 to use THAT? Although, I kind of get it. No money is too much to leave THAT delinquent DDR creation behind. Sorry, I’ve wanted to do this for a long time. Anyway, keep in mind that in the last 3 scenarios I would have to book a separate flight between Israel and Europe. 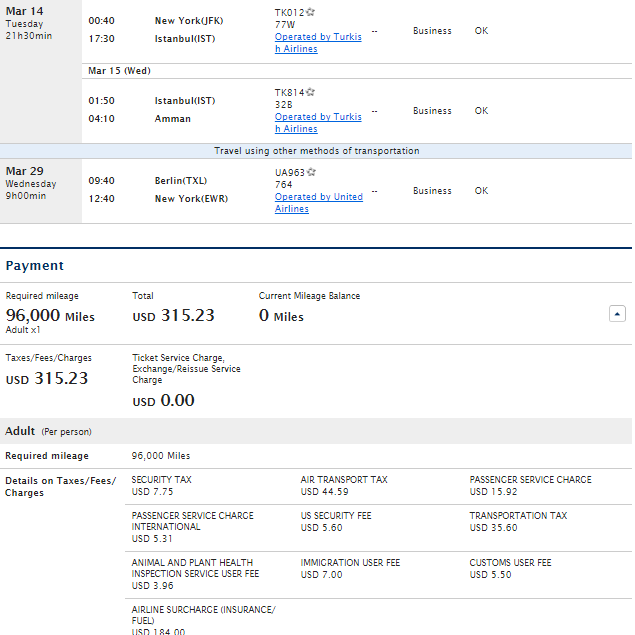 I could fly to Berlin for 10,000 Avios, or to Warsaw or Istanbul for 25,000 United miles (the rates are in coach). 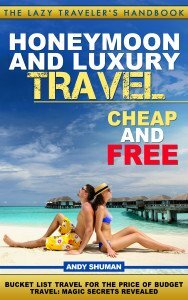 In any scenario, I’m looking at spending around 106,000-121,000 miles plus $315-$470. Honestly, I don’t think the savings would be worth it. If I choose a round-trip flight, I’ll go with the first scenario. I’ve just tried to show the options. Only because they do exist. The whole trip falls under 20,000 flying miles and would cost me only 115,000 ANA miles in Business class provided I can find award space for all these segments. Or less, if some segments are in coach. Or more if in First. Airport taxes and fuel surcharges would add a few hundred dollars to the bill, but we are talking about visiting 4 fascinating cities for about the same miles as a round trip. But Maybe There Is Another Way Around — Literally! 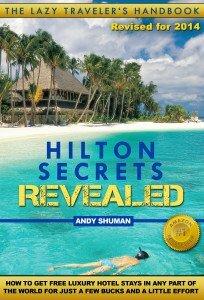 Unless you are extremely inflexible about your travel, there are usually things you can tweak. I know, for example, that I must be in Jerusalem on certain days, because this is when and where the conference is. I’ve chosen to visit Petra before going to Israel rather than after, following the advise of an acquaintance who has gone the same route. Other than that, I have a few days before and a few days after, but I know that I’d rather explore Israel after the conference because, I’m sure, I’ll pick up some pointers. So maybe I’ve been looking at it from the wrong angle. Maybe I should go West instead? Go West: Stopovers in Seoul, Istanbul, Jordan, and Tel Aviv. And this trip falls under 17,000 miles, which means it would cost me 105,000 ANA miles in Business Class plus an open jaw between Tel Aviv and Berlin for 10,000 Avios. So, it’s not like jetting around the world would actually save you a lot of miles, although I’m sure you could find these extremely sweet spots if you tried. 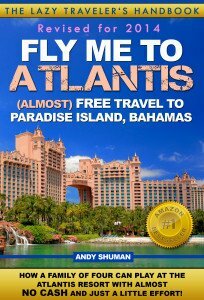 But with up to 8 stopovers, it certainly gives you more freedom. What say you? Can I do even better? 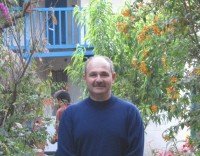 I have read through the ANA series and have two semi related questions. First, earning ANA miles can be a challenge, but you mention the ability to transfer MR or UR. But I am unclear on how you would do this, since ANA doesn’t appear as regular partner. Second, the round the world award does not have a direct link to any ANA page. Can you provide this? I’m very confused here. Any suggestions if I want to fly from us to South Africa and make it in around the world using ANA? Thanks for your comment, Mara. 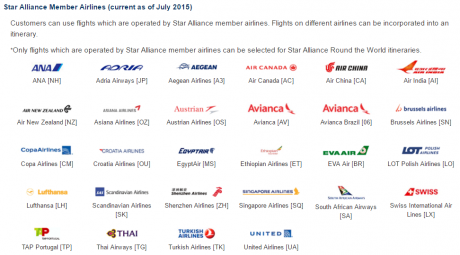 You can use any Star Alliance airline for the Round the World ticket. There are a lot of possibilities, actually. Off the top of my head, you could fly to South Africa on South African Airlines, continue on Turkish to Istanbul, fly Asiana to Seoul, continue to Tokyo on Asiana or ANA, and come back to the US on United. That’s just one example. I am looking to do a RAR-SYD (NZ) // SYD-BCN (SQ) // PMI-FRA-NYC (LH) booking (about 18500nm as per gcmap), which in J on ANA’s RTW chart would only require 115000miles pp (SQ alone charges 105K pp from SYD to BCN) – can I use a RTW for that routing, or do I need to start/end in the same country? Correct, you must start and end in the same country. What if I started in Texas, went east, but ended in Hawaii? Same country still? Wouldmthat work? That’s a good question. ANA lists Hawaii separately from North America, although in the same area, but it’s hard to argue that Hawaii and Texas are in the same country. It should work, but I’d call ANA and ask (ANA people are really good). Would CNX-CDG-CPT-PER-SYD-CNX be acceptable for a round the world ticket? Someone on another site said you must visit all three regions (Asia Europe Americas) on an ANA round the world ticket, but I don’t see that rule on the ANA site. Thank you. This is a non-starter. You must touch all 3 zones (not necessarily “Asia Europe Americas”) but you can’t make do without Americas or Hawaii. Another problem is that you can only use Star airlines for a RTW ticket, and no Star airlines fly these routes. If you use connecting flights and ground segments, you may or may not run into other restrictions. It looks to me like all of these legs could be flown on Star airlines, except PER-SYD. Thai, Lufthansa, South African, Singapore. I suppose one could come up with their own transport for the PER- SYD leg. If I have visit the Americas, I’m out of luck..
IS there an easy way to calculate how many miles your total trip would be? I am somewhat confused as the website says “*For Round the World itineraries, required mileage is calculated based on the total basic sector mileage.” Or isthere a website where I could enter my proposed itinerary and see how many miles I would travel and therefore how many miles I would need? I am confused as to how to calculate how many miles I would cover with my proposed itinerary and therefore how many miles I would need. The website says “*For Round the World itineraries, required mileage is calculated based on the total basic sector mileage.” which I don’t understand. Or is there a website that would calculate how many miles I would b e traveling? Yes, there is. Go to GCMAPS.com and enter the string of the airports you want to travel to (i.e. LAX-NRT-IST-JFK). 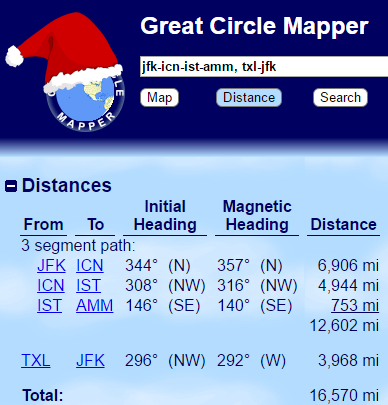 You’ll need 3-letter airport codes, but there is a look-up function to find them). The result might differ from the ANA count, but insignificantly. After you know your mileage, find availability for your flights and call ANA to make a booking. Try to be as specific as possible including the dates and flight numbers. In my experience, ANA agents are very good.